that's unsettled or lost or unjust? now, this life that's all mine? treasure - when I look at me! Gorgeous Selfie of you and fabulous words. I love the idea of choosing what you see in the mirror. Can I copy your words to use just for me? Love this. You are so deep. I hope you only ever see treasures! what a great entry!! i see only treasure when i look at you...you look beautiful adrienne....inside and out!!! Only treasure, my dear, only treasure. hmm...I needed this thought when I viewed recently taken pics of me. Sadly, I did not see any treasure when first viewing them. Thanks for the boost, and I hope you're following your own great thought! You are a treasure for sure. Beautifully put. What a perfect place to find old treasure... A great reflections too ; what a nice self portrait ! Oh... I just love this. Did you make up the poem? And the photo of yourself goes just perfect with it. What insightful poetry and it's a great photo of you; love the depth of field. Great poetry. I liked it and seeing a photo of you as well. 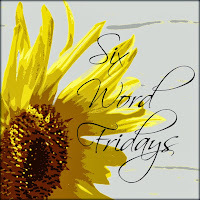 Hoping to join in on 6 Word Friday soon. Powerful poem. I really like the way your reflection photos play to the poem or vice-versa, either way, well done!